Music theorist before composing his most important works, Jean-Philippe Rameau is one of the most famous exponents of so-called "French" music of the Rococo era. Here are 10 little things you probably didn’t know about him. We all think we know Jean-Philippe Rameau: great composer at the Versailles court, author of The Descendants of Boreas… And yet, this character full of contradictions remains a mystery, as reflected by the first forty years of his life, about which very little is known. His father Gauthier, teacher at the Jesuit college at Godrans (Dijon), reported that young Rameau “used to sing during school hours, or sometimes he would write music; he disrupted classes”. In 1697, the teaching staff asks Rameau to make his son leave, when he is only 13. Rameau decides he wants to be a musician rather late. This is why his parents send him to Italy when he is only eight to study. His first stop is Milan, where he stays for a short time, joining a travelling company. As reflected in the following anecdote: when working as an organist at the Clermont-Ferrand Cathedral, he writes his Treatise on Harmony. Nevertheless, he wants to travel again in order to improve his skills, but his leave is not approved. In order to bring his employers to his knees, he waits until the Feast of Corpus Christi to hide all the organ registers and play deliberately out of tune until he finally obtains a leave of absence. Let's start by looking at the age at which he marries: forty-two years. Shortly after moving to Paris to live permanently (when he is 40), he marries 19-year-old Marie-Louise Mangot, born into a family of musicians from Lyon, but more importantly, whose father is symphonist for the king and whose brother is musician at the court. Likewise, his career as a composer is not really launched before 1733, when he is fifty years old, at the time of the opera Hippolytus and Aricia and its libretto written by Abbé Simon-Joseph Pellegrin. At the same time, the quarrel of the Ancients and the Moderns begins: a debate which opposes the supporters of the French opera in the style of Jean-Baptiste Lully against that of Rameau. We cannot refer to the life of Jean-Philippe Rameau without talking about the so-called Querelle des Bouffons ("Quarrel of the Comic Actors") in which he was involved, reluctantly. One of his most scathing opponents is the famous Jean-Jacques Rousseau, not as a philosopher, but as a composer. Rousseau arrives in Paris in 1742 and dreams of glory, just like Rameau, whose works he studies passionately. In 1744, Rameau’s powerful patron - Alexandre Le Riche de La Pouplinière - offers the composer the opportunity to have someone play his opera Les Muses galantes. Rameau agrees to listen to the piece by the one who is supposed to be his disciple, but who accuses his works of being heterogeneous, stating that some of them seem to come from "an ignorant person who did not even know what music was ". Later, in the field of theory, the Genevan philosopher will take out his hatred especially in the articles on music that he publishes in the Encyclopaedia of Diderot & d'Alembert. During the performances of his works, he would always hide in a small lodge, away from the audience, sometimes even lying on the floor, so no one would see him. During his operas, he would sit on the floor alone. Anyone who came close to him would be rejected by his silence and a hand gesture. After his death, they discovered about 240,000 pounds (livres), a quarter of which was in cash at the bottom of a safe. On the other hand, he only had a pair of shoes, which is not much if we consider the long walks he would go for every day, and we also know that he had been sparing money for a long time in order to give her daughter a significant dowry. In addition, he would help financially some (according to him) talented artists such as Dauvergne and Venevault. 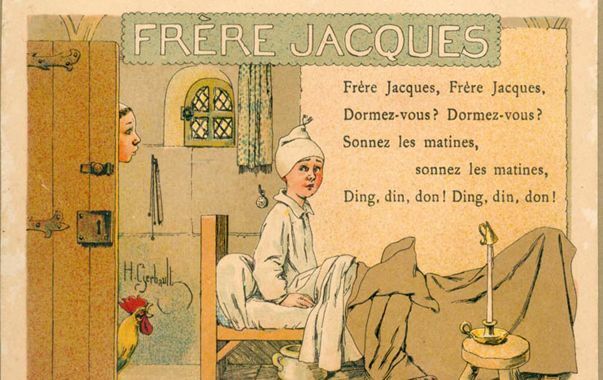 “Brother John”, one of the most famous nursery rhymes, was reportedly composed by Rameau in person. In this article, you will find the results of our investigation.